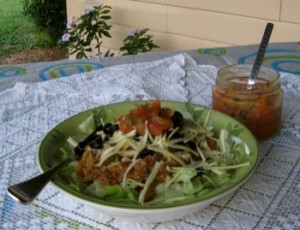 This versatile filling can be used in conjunction with Shredded Lettuce, Diced Tomatoes, Chopped Green Onions, Sliced Black Olives, Chopped Jalapenos, Fresh Salsa, Fresh Sliced or Diced Avocados and some grated Cheese to make Burrittos, Taco Salad or if you are very lucky and have someone around who can make Bannock, Indian Tacos! Heat olive oil in fry pan, saute onion for a few minutes. Add garlic and continue sauteing for another minute or two. Stir in “mince”, breaking it up with the back of a spoon. Stir in salsa, water, Lemon or Lime juice, chopped jalapenos, if using and Adobo Seasoning. Bring to a boil, reduce heat and simmer until heated through. 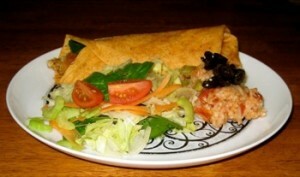 Burrito – Spoon taco filling down the centre of a tortilla; add toppings of your choice and roll up, tucking in bottom end. 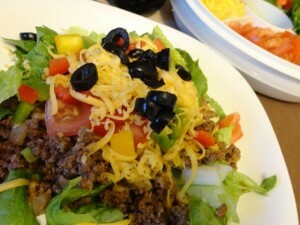 Taco Salad – Fill a shallow bowl with a heap of shredded lettuce, layer on diced tomatoes, sliced black olives, chopped jalapenos, followed by 1/3 cup Taco Filling mix. Top with shredded cheddar and extra salsa. Make it how you Like it! 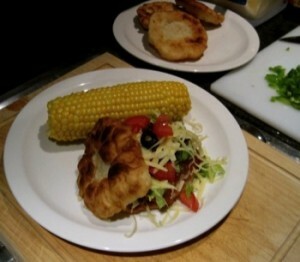 Indian Taco – Split a piece of Bannock in half; top with Taco Filling and your choice of toppings. One of my Favourite ways to have Bannock!